I've basically been dreaming about these mussels ever since I had them four months ago. I discovered these beauties as part of a summer trip to the South of France during my stay in Cannes. My friend Dana and I were craving some quintessential French dishes. She wanted French Onion soup, and I was in search of some moules frites (mussels with fries). We found them both at an adorable little French restaurant on Le Suquet called La Beija Flor. 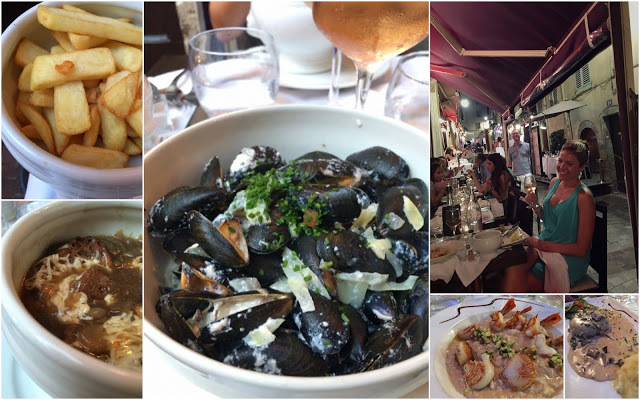 We sipped rosé and people watched and stuffed our face with French food and it was glorious. We also made friends with the owner of the restaurant, Christophe, who informed me that the mussels were actually a family recipe. It came from his grandfather, Antoine, who is from Normandy. Christophe was kind enough to email me the recipe once the busy summer tourist season calmed down, and I finally had a chance to make them yesterday. As I mentioned, Christophe's grandfather is from Normandy, where hard apple cider is just as prevalent as wine. It is for this reason, you will find that most Normandy mussels recipes call for hard cider and/or Calvados, which is an apple brandy from Normandy. 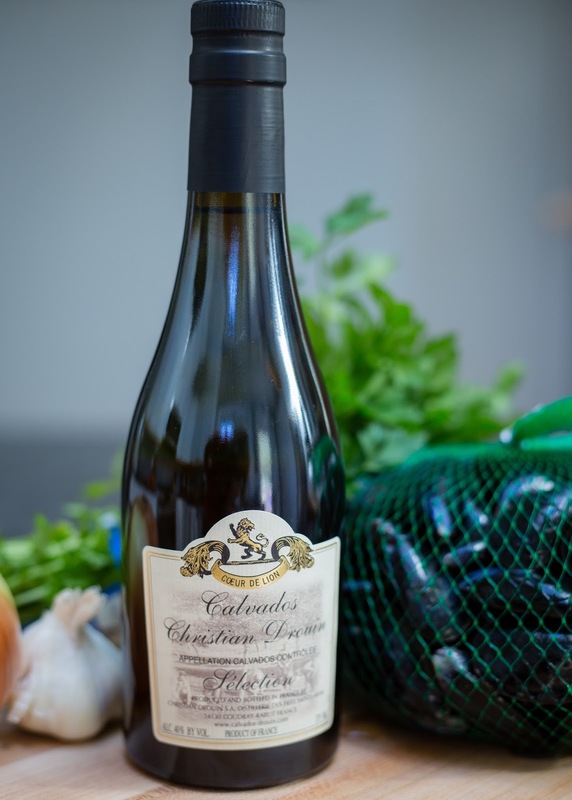 Antoine's recipe uses both white wine and Calvados. Normandy-sytle mussels also call for a very heavy cream. As Christophe informed me, the "pouring cream" in France has 45% butterfat. Our heavy cream in the U.S. generally tops out around 38%. So do your best to find the heaviest, fattiest cream possible. I used some given to me by my neighbor from a local farm. (You could also try adding a little butter to the pot). Despite my inclination to sauté the onions and garlic ahead of time, Christophe assured me everything is to go into the pot at the same time. This makes for a ridiculously easy dish that cooks in about 8 minutes. Don't forget to serve with crusty French bread to sop up the delicious sauce. And if you close your eyes, it *almost* feels like you're back in the South of France. (OK, not really, but they are still super delicious). Scrub and de-beard the mussels. 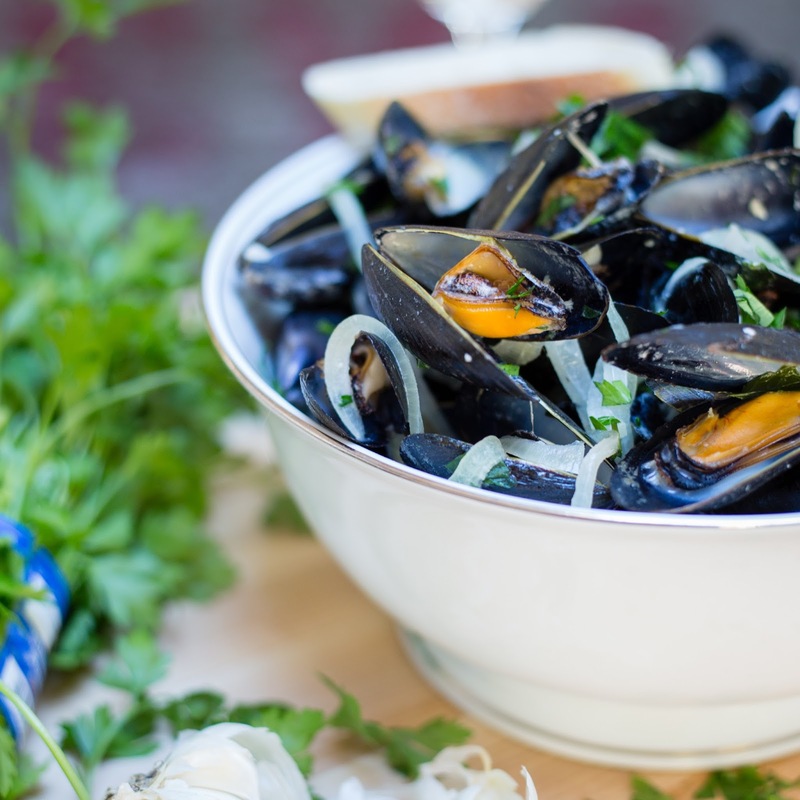 Discard any mussels that are open and do not close after a little tap to the shell. Rinse remaining mussels and place in the bottom of a medium, heavy bottomed pot. (I used my Le Creuset). 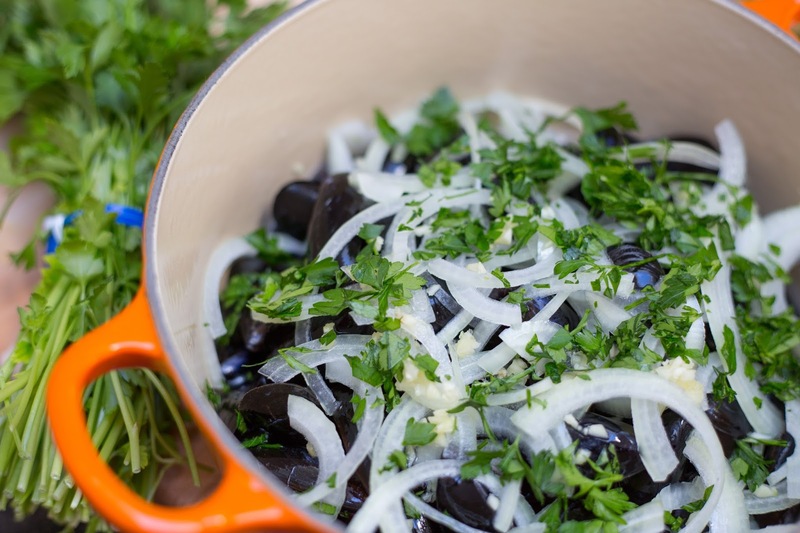 Pour the wine and Calvados over the top, and sprinkle with onions, garlic and 3/4 of the chopped parsley. Pour the cream over the top of everything and season with pepper and a just a little salt. (The mussels are salty on their own). Cover and heat on medium-high for 3 minutes. Give the pan a good shake and reduce heat to medium. Cook another 5 minutes, or until all mussels have opened. (Discard any that did not open). Transfer mussels to bowls and pour liquid over the top. Sprinkle with remaining parsley and serve with crusty French bread. Thank you for posting this recipe. It turned out amazing. My wife and I were reminiscing about our time in Normandy and the moules Frites we enjoyed. 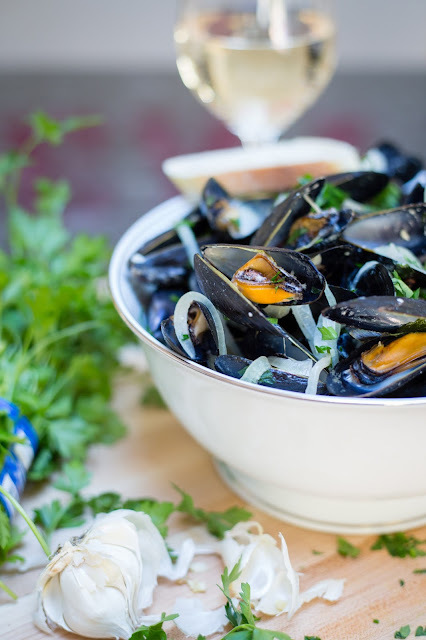 This recipe brought us back for sure .I used a cider called Apple Pie which gave the mussels a sweeter flavor that I truly enjoyed. You're very welcome! I might need to make these again soon... sooooo good! !